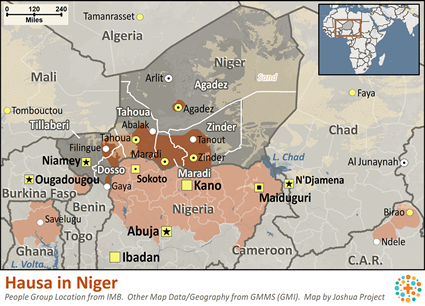 The people of Niger belong to many different ethnic groups, each with its own language and customs. One of these groups is the Hausa. They are the largest ethnic group in West Africa, a high majority of which are Muslims. They are originally from "Hausaland," a region covering 75,000 square miles and straddling the borders of Niger and Nigeria. From 1890 to 1960, Hausaland was divided into two sovereign states under French and British rule. After 1960, one became the Federal Republic of Nigeria, and the other, the Republic of Niger. While French is the country's official language, Hausa is the language of trade. 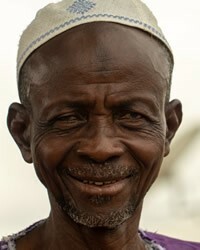 The Hausa are primarily farmers and shepherds or traders. Among the farmers and shepherds, two-thirds have additional non-agricultural jobs. Markets are a traditional part of Hausa society, carrying social as well as economic significance. Male friends and relatives meet there to discuss village affairs, while young, well dressed single women pass through to see and be seen. Most of the Hausa live in rural farm villages with populations ranging from 2,000 to 12,000. Both inside and outside the villages, one-third to one-half of the population live in small farm settlements made up of extended families. These economic kin-based units live under the authority of the male head of the household. In marriage relationships, close relatives, preferably cousins, are chosen as partners. It is a patrilineal society, or one in which the line of descent is traced through the males. Girls often marry between the ages of 12 and 14. Unfortunately, fifty percent of the women are divorced; but because there is such pressure to be married and have children, most of them will remarry. In Niger, a woman's marital status determines her social importance. The Hausa of Niger have adopted the kulle tradition of Islam, meaning that they seclude their women. This does not mean total seclusion; they are free to visit each other in the evenings and go on extended visits to relatives. Many of the women actually prefer seclusion because it releases them from hard labor in the fields and allows them to spend their energies on personal economic pursuits. The Hausa Muslims are known for being hospitable to strangers. In Niger, it has even become a source of national pride. In the Hausa language, one word, bako, is used to define both "guest" and "stranger." By 1500 A.D., Islam had been introduced to the Hausa by Arab traders. Many of the urban Hausa embraced it right away, in hopes of enhancing their businesses. However, the villagers were not as receptive to this new religion. Today, many of the rural Hausa are only superficially Muslim, and their religious practices have been mixed with local traditions. They believe in a variety of spirits, both good and bad. Traditional rituals include making sacrificial offerings to the spirits and to the spirit possessed. Most rituals are performed by family members, but specialists are called upon to cure diseases. * Ask God to strengthen, encourage, and protect the small number of Muslim Hausa who have become followers of Jesus. * Pray that traditional Muslim culture will soften, creating open doors for the Gospel. * Ask the Holy Spirit to open Hausa hearts receptive to the Gospel.View Hausa in all countries. Location in Country: Widespread in cities; along Nigeria border.